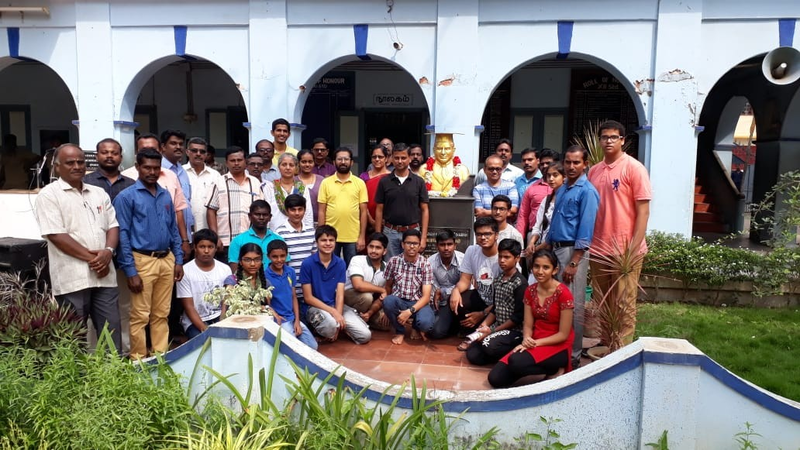 Our Ramanujan Yatra group of 24 Yatris headed straight for the Ramanujan Museum in Chennai after a sumptuous lunch at Ananda Bhavanam in Adayar. The participants from Mumbai and Pune were shocked to see the quantity of boiled rice and the absence of chapati for lunch but enjoyed their full course Tamilian lunch. Our two traveler buses entered the teeny weeny lanes inside which the museum was located and we got down in front of the museum. The place where the museum is located doesn’t look very amazing, but do bees ever find honey outside the flower? The Director of the Ramanujan Museum, Mrs. Meena Suresh, started off the first session with the inspiring story of P.K.Srinivasan (fondly known as PKS), a very inspiring Math teacher who dedicated a major part of his life towards popularising the life and works of the great Mathematician Srinivasa Ramanujan. It was PKS’ dream to start a museum with the same name. So with the available resources that he had at his disposal, which included his own house, he converted it into a museum. The ground floor is an auditorium where we had our session and upstairs was the museum. PKS was immensely passionate about Ramanujan and he went around talking and writing to people right from the top officials to ordinary people. In his own words, ‘I got 99% appreciation and 1% action’. In short, no one offered any help for his idea of starting a Ramanujan museum. 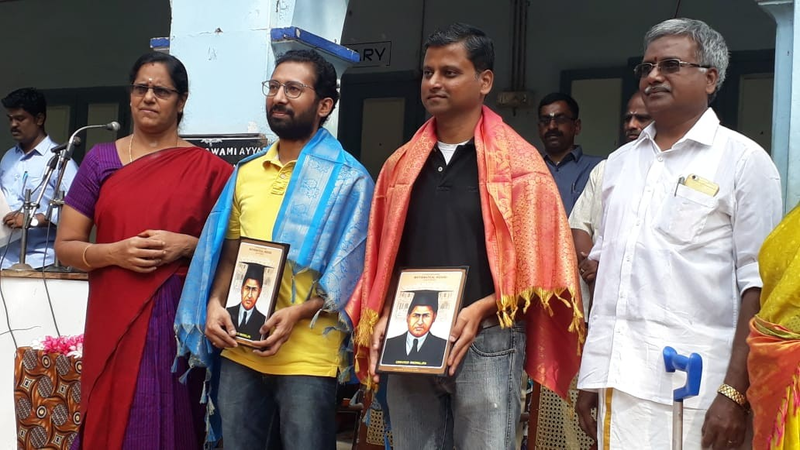 In the end, he along with some of his students went to Kumbakonam where Ramanujan was born and the students asked every person they met on the road if they knew anything about Ramanujan. After a lot of search, somebody told them that the address of the house where Ramanujan lived. Remember, this was the time before SASTRA University took took up the task of preserving Ramanujan’s house as a monument. It was PKS who found out the house (which now belonged to someone else) and finally the house is now preserved in the honour of Ramanujan. Mrs. Meena Suresh, continued with a lot of stories about Ramanujan and PKS, and it was thrilling to listen to her because she had been associated with PKS herself (no wonder how she had the zeal in her). We continued our session on a brief sketch on the life of Ramanujan and ended with birthday magic squares. The participants then went to see the Math manipulatives that the Museum had (which also has a Math education centre in it) had and played with a lot of tools for working out algebraic identities (much more than what’s usually done in schools). The last part was the visit to the museum. How do you express your feelings and emotions into a bunch of words? It was an inexpressible feeling for all of us to be in the room which displayed copies of the letters that Ramanujan wrote to Hardy and how Hardy responded with his nudging remarks (for the initial letters). Several Mathematical discoveries of Ramanujan were put on display. What was fascinating was that some of them were so simple and easy to understand even by a 10 year old. 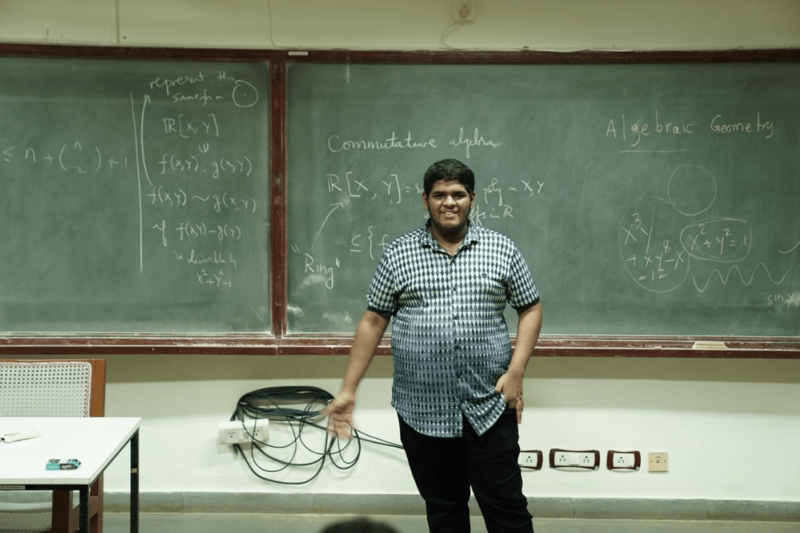 All of us were intrigued by the same question that baffles everyone when they think of Ramanujan – Where did all this come from? The more one reads about Ramanujan, the more is one left clueless and the feeling of being gazing into infinity creeps in. After an overnight journey from Chennai to Thanjavur, all of us settled down at the TTDC hotel. After a couple of hours of rest, we were all set to start our day in Thanjavur. A filling breakfast of Idli, Vada, Upma and Dosa, followed by a tasty filter coffee pumped all the energy into us and we left for Marabu Foundation run by Dr. Rama Kausalya in Thilaisthanam. Marabu is an initiative to promotive and preserve old Carnatic musical compositions which are not very well known today. 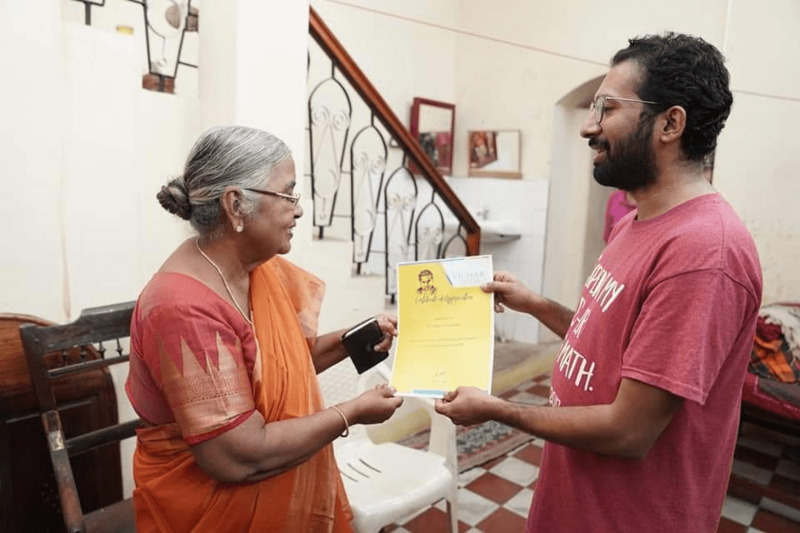 It is run by Dr. Kausalya, a 70-year old musicologist . She was kind enough to let us have our sessions in her 150 year old house in an ‘Agraharam’ (chain of housing by Tamil Brahmins in the past). All of us also had a great opportunity to meet her 94-year old very healthy and active mother, and her 99-year old teacher (who still does Yoga for 1.5 hours everyday). Our sessions started with the first letter Ramanujan sent to Hardy where he starts with the famous words – I beg to introduce myself as a clerk from the Accounts department…., and then moves on to give his theorems. We started off with the famous claim made by Ramanujan that sum of all natural numbers is -1/12 and saw a couple of proofs why it can be true. The focus was also to read carefully the words that Ramanujan chooses in his letter where he writes – ‘…under my theory, this is true’ which prompts us to question whether what we have understood is the same thing that he refers to as ‘theory’. After some questioning and analysing, we moved on to the topic that might look scary – Nested Radicals. The participants loved the topic and ways to approach solving the nested radicals using simple identities like (a+b)^2. The last part of the session was to look at another research area of Ramanujan – Continued Fractions. It was also very interesting for students as it didn’t require any knowledge of higher level Mathematics. After a sumptuous meal offered by Dr. Kausalya and some great interactions with her on the architectural aspects of these houses, we moved on for some sightseeing. Our travel partner, Rajith Nair from the Traveling Gecko, took us to what is believed to be a 2000-year old dam Kallanai or the Grand Anicut and explained the amazing history of the place. 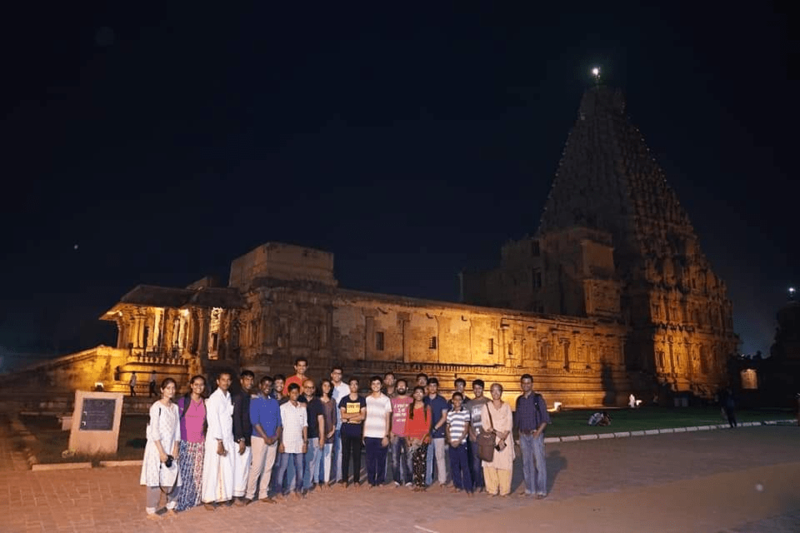 We then moved on to the palace in Thanjavur where we had the opportunity to meet one of the present members of the Thanjavur Maratha Royal family, who descend from a half-brother of Shivaji. 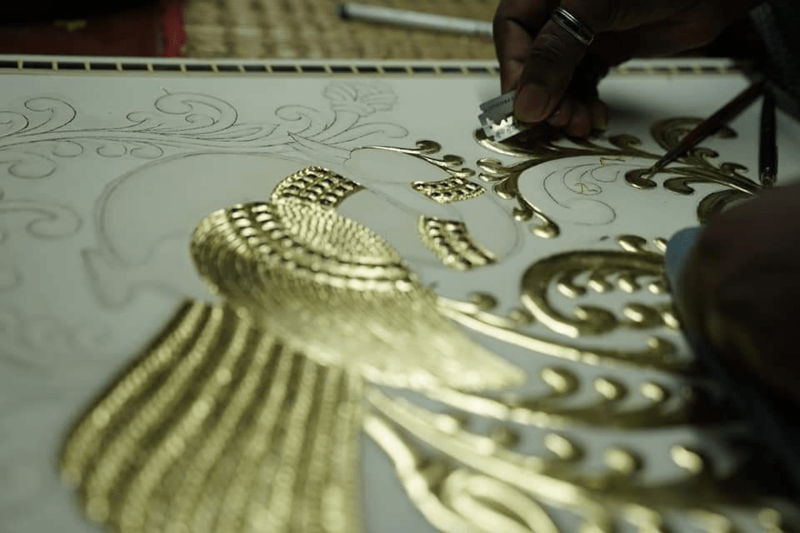 At his palace, we saw how the artisans paint the beautiful Thanjavur paintings using real ‘Gold’ and how meticulous their work is. Our local guide Anirudh explained to us in great detail about the history of the place and how the king promoted art in those days. He apparently had an army of artists who always traveled with him. The final halt was the famous Brihadeeshwara temple (also known as the Big temple) which is one of the UNESCO World Heritage sites. Anirudh took us around for more than an hour explaining about the history of various sculptures that walled the huge structure and also different theories of how the temple could have been possibly built 1000 years ago. The engineering feat of the gracious structure which has stood up against time left the pilgrims with awe and wonder. All the 24 pilgrims of Ramanujan Yatra retired to the rooms with the beautiful images of the sculptures of the Big Temple and the amazing equations given by Ramanujan. For Muslims, it is the Mecca. For Christians, the Vatican. For us, today it was Kumbakonam. The 24 pilgrims of Ramanujan Yatra, today is a day that all of us will remember for the rest of our lifetime. We had the great fortune to be at the Town High School in Kumbakonam where the great Srinivasa Ramanujan studied. We got goosebumps as we set our foot on the holy ground. We were received with a lot of love by the Headmistress and the Mathematics teachers. Being Nov 14th, they had a cultural show by 6th and 7th graders which we were going to witness. But before that, they just announced that I will be hoisting the National Flag and inaugurating today’s event. I was stunned for a moment but then overjoyed with the thought that I would get the opportunity to hoist the flag in none other than the hero’s school! Following the flag hoisting they honoured my colleague Yogesh and me with a shawl and a photo of Ramanujan. It was a very humbling experience. 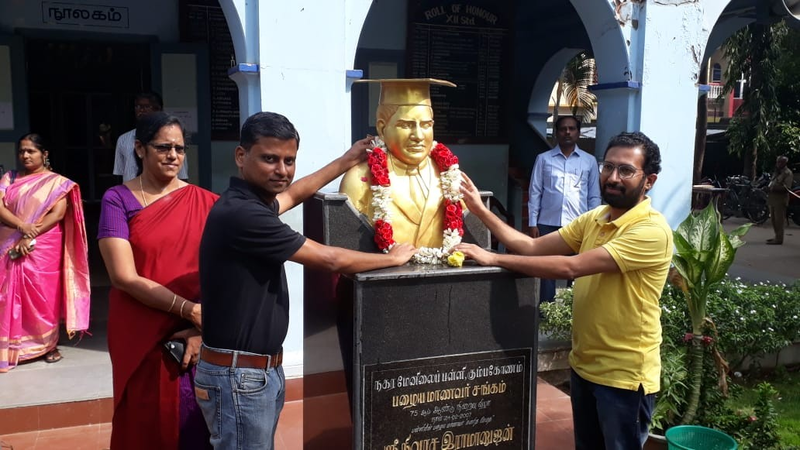 Then we placed a garland around the bust of Srinivasa Ramanujan. We were overcome with the feeling of that ‘nothing more remained to be achieved in life’. We then sat for the Children’s Day celebrations that lasted for 20 minutes or so. Following that we went into the oldest block – Ramanujan block, in the school which has been there since the time of Ramanujan. All our Yatris were thrilled to enter into hall and as they entered, they were welcomed with a loud applause by the students of 9th grade who were waiting for all of us for an interactive session. The session started with some display and explanation of traditional games that areplayed in rural areas in Tamil Nadu. Girls showed some games with pebbles that they play which requires a lot of skill and hand-eye coordination. That was followed by some board games (like Pallankuzhi, Tiger-sheep game, etc.) which requires strategy. The game of tigers and sheep was a favourite game of Ramanujan which he used to play with his mother when he was a boy. After the wonderful demonstration and explanation of traditional games by the students of Town High school students, one of our participants (Hetvi, 9th grade student from Mumbai) did a session for the young Ramanujans of Town High. 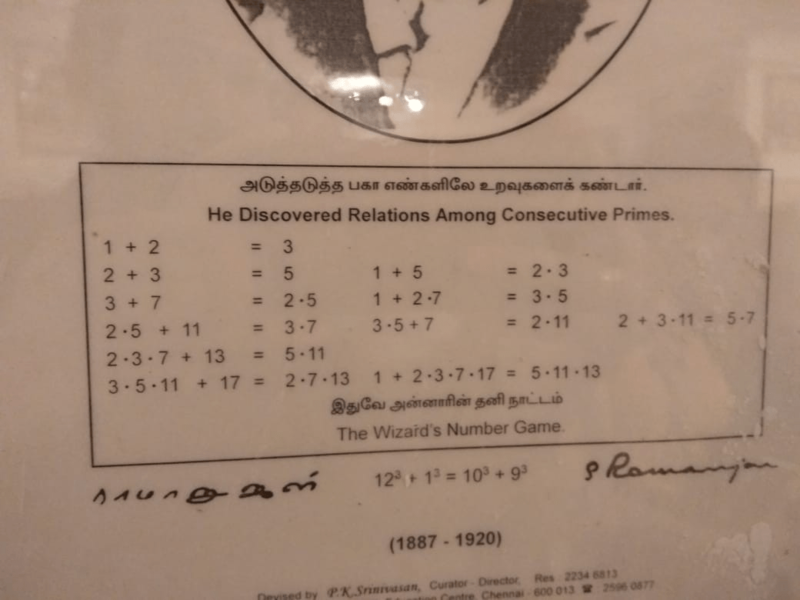 The session was on the Theory of Partitions in Numbers, an area in which Ramanujan had made a phenomenal contribution and one of the reasons why he was awarded a Fellowship of the Royal Society. Her presentation was simple and easy to understand and the audience enjoyed working out the questions that she posed them. After Hetvi’s presentation, there was an interactive session between the students of the school and our Yatris. 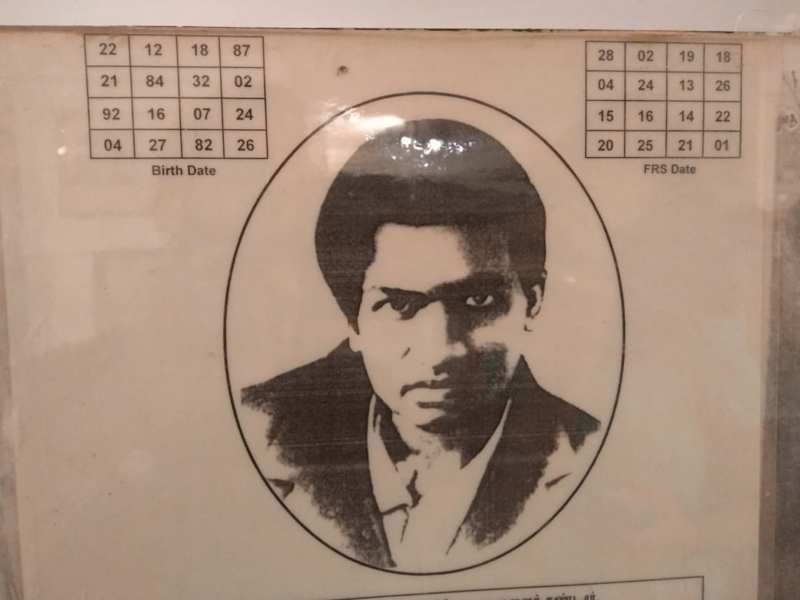 They asked each other several questions like – how does it feel to be studying in the school where Ramanujan studied…what aspect of Ramanujan has inspired you….how did Ramanujan arrive at the property of 1729…and so on. All this while, more than 25 teachers and more than 100 students from the school had participated in the session. All of them were being attentive and it was a sight to watch them. We were served a delicious Sapadu (meal) following which we took a round of the school. It was very hard for us to leave the school. In a short span of time, all of us were connected so strongly to the placeby the love showered by all of them. But for what? 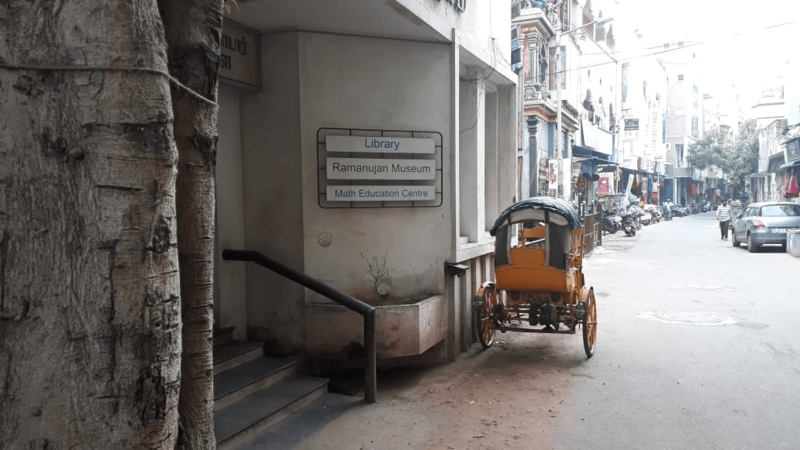 The people over there were just lovely and they just loved the fact that we were on this Yatra to study the life and works of Srinivasa Ramanujan. Something else that I shouldn’t fail to mention was that the school has 3000 students from grade 6 to 12 in both English and Tamil medium. Many students come from humble backgrounds and many ex-students of the school support the education of present day students who cannot afford the same. What a way to give back something to yor alma mater! And of course, it would be because they would have felt how influential their school was to them when they studied there. With a heavy heart, we bid good bye to the place and left for the Ramanujan Museum at SASTRA University, Kumbakonam. The museum is very well maintained and has a good number of letters, notes, findings of Ramanujan. The Yatris couldn’t just finish going through all of them. If one has to read everything in detail, a couple of hours wouldn’t be sufficient. With great detail many of them penned down the notes (as photography wasn’t allowed). After a hour, we were about to leave for the great man’s home at Sarangapani Street. We reached there in less than 5 minutes. How would an Ayyappa Bhakta feel when he arrives at the 18 steps of Sabarimala? How would someone who has waited all their life to visit the religious place closest to their heart and now has arrived at that place? Nothing less was our feeling. All of us went inside the typical Brahmin home which is preserved by SASTRA University today. The first room in the left has a window that faces the road. It was written there that Ramanujan used to look out of the window, lost in thought, for long hours when he was a child. I tried looking outside just to see if I can get the feel and if in the least probability could see something Ramanujan saw while he gazed outside. All the Yatris came inside to check out the small house. I could see some of them walking inside quietly with an indescribable feeling sinking into their hearts. We spent ample amount of time wondering where Ramanujan would have sat to have food…how he would have worked on Mathematics while his mother would have fed into his mouth the rice balls she would make for him…and how he would have worked on Mathematics as he grew up in that house. We stepped out after our hearts overflowed with contentment. We wanted to go to the Sarangapani temple where Ramanujan was known to spend a lot of time discovering Mathematical formulae. But unfortunately, the temple was closed as a matter of practice that they follow whenever there’s any death in the locality. It was a bit of a disappointment, but that could not overshadow our contentment. We left Kumbakonam after having some Pakodas and filter coffee and reached Thanjavur to board the bus to Chennai. The face of all the Yatris were lit throughout the day, for, they had visited their Kasi and Ganga! And as they bring Ganga water with them, some of us took a handful of sand from the ground in the Town High School where Ramanujan’s footsteps would have fallen some time. All that we can say, is that we felt blessed! running from one shelf to the other wondering which book to take and which one to reject (I was one of them). It was sheer joy to see them engrossed in the books for the next few minutes. But we had to move on for an interactive session with some Mathematicians – a profession that some of them might choose later on in their lives. Prof Ramanujam had arranged an interaction with some faculty members and a couple of research scholars from the Mathematics department. The session got extended to almost two hours from what was planned earlier (for 75 minutes). The faculty gave a brief overview of the areas of Mathematics in which they work and students asked their questions to them. They also shared how ‘cool’ their life is. They get to wear whatever they want…there’s no one to boss them like the corporate…they get to do Math the whole day…and they get paid for all this! I think that’s an amazing life to aspire for for those who are passionate about Mathematics. After some great discussions, we moved on for lunch. IMSc was kind enough to treat us with a delicious lunch and special ice-cream (because there were kids for lunch), a yummy evening snack and also dinner. From IMSc, we moved to Chennai Mathematical Institute (CMI), one of the best institutes for pursuing Mathematics and Computer Science for the under-grad. CMI was almost an hour’s drive from IMSc. In the bus, as in the previous days, some of them enjoyed playing chess with each other, some were busy working on Math and some enjoyed a small nap. At IMSc, the participants got an idea of PhD programs. At CMI, they would be introduced to under-grad programs and how ‘cool’ life at CMI is for a student. What I loved the most about CMI is that, they don’t care about your IIT-JEE scores as it does in many other institutes. You get in by qualifying their entrance test or by getting selected for the training camp for International Mathematics Olympiad (IMO) which is almost the final level after they clear Regional Mathematics Olympiad (don’t mistake it for all so-called Olympiads that have come up in recent times). CMI also takes in students those who qualify in similar Informatics and Physics Olympiads. We had three Profs who teach at CMI who interacted with us and shared about life at CMI and how the faculties pursue research. During some interaction, a participant asked – how different are courses at CMI from other under-grad courses. A professor replied that he doesn’t know how courses are offered in other colleges, but in CMI, they don’t spoon feed things to students. If they feel that students can work on some areas and learn on their own, they will just leave it there and expect the students to take it ahead. Of course, the students being the cream, they enjoy this process of learning. The faculties have less teaching burden and they focus a lot of on their personal research work. Students in CMI are also allowed to attend courses at IMSc for free. Students have a lot of bonuses – the entire under-grad is almost free of cost! Like IMSc, CMI also has an excellent library which the students can use 24×7. Once the interactions with the faculties were done, the participants got a chance to talk to one of our students, Sundarraman, who got admitted in CMI this year. He shared his experiences so far and how his peers and seniors are very kind and supportive in teaching/learning/doubts. Once again, like IMSc, it was difficult to bring the kids out of the library after the interactions with the Profs. Finally, I had to promise them that we will come here some other time. We left CMI for IMSc. Since the past few days we were discussing about some subtle aspects of Ramanujan’s life, about the people who played a vital role in his life, about his story in depth and about his works. It was time to connect the dots. And what better way than to screen the Hollywood biopic on him @The Man who Knew Infinity. We screened the movie in the Ramanujan hall IMSc. There were all sounds of sobs and one could see the neighbor wiping his/her own tears. Some found it very difficult to control their emotions after the movie. It was very touching to see these young minds feel about Ramanujan. All of us moved out of the hall in silence with Ramanujan in our minds. – Draw parallels (similarities and dissimilarities) between Hardy and Ramanujan. – What positives and negatives do you see in the personality of Hardy, Ramanujan and Komalatammal (Ramanujan’s mother)? – Suppose Ramanujan would have lived longer…i.e., after his return from Cambridge, let’s say that his health would have recovered and he would have lived a longer life….what do you think might have happened? Hypothesize three stories that would have happened in Ramanujan’s life if he would have lived longer. – The great Mathematician, P.K.Srinivasan, who started the Ramanujan Museum in Chennai and tried popularising Ramanujan and his work, had a dream that every city in India would have a museum on Ramanujan. If we were to start one in our city, how would we go about it? Can we create a sustainable model where the museum can keep running? The participants had a great brain-storming and came up with very interesting answers. It was interesting to see the stand by the participants on Komalatammal’s life and how they saw she brought up Ramanujan. Hardy was appreciated by the participants as much as (if not more) Ramanujan. The drawing parallels was an interesting thing and also the stories that they hypothesized on the life of Ramanujan if he would have lived longer was worth a script for another Hollywood or Indian movie. The inputs on creating a museum on Ramanujan was excellent and we at VicharVatika have got inspired to start one in Mumbai (those interested in the project can contact us). It was difficult to accept that the Yatra had come to an end. All of us had become one family of Math-lovers. With a lot of hope that we all would catch up soon, we bid each other good-bye. The idea of Ramanujan Yatra had popped up while Rajith and I were discussing (about an year ago) about the excellent work he does at @The Traveling Gecko on culture and heritage tourism in Kerala and Tamil Nadu. We thought, why not do a Yatra on the life of Ramanujan? Thus the idea emerged as a bud and finally attained full bloom in this week. The credit for the feel of the entire Yatra goes to Rajith who is a personification of meticulous work and precision. He was there throughout our Yatra making all of us feel comfortable even though we tortured him by making him sit through all the Math sessions. Our sincere thanks to Rajith Nair and his wife who helped us throughout the Yatra. 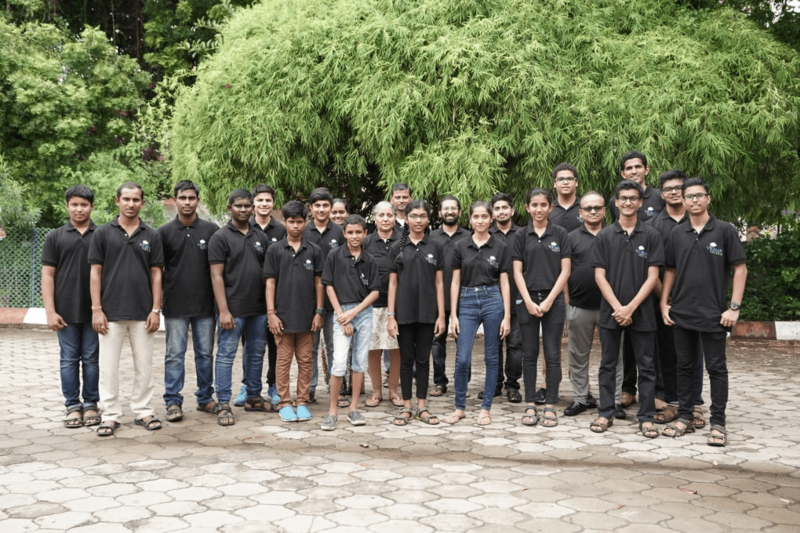 Our friend Sriram Naganathan had been with us all the way long giving us a lot of support with logistics, connections and encouragement throughout the way. Indic Academy was kind enough to support and sponsor some participants who came from humble backgrounds. My brother Veeraj Nair captured all the emotions by standing behind the lens of his camera. Nandakumar and Mali from Chennai helped us take the message of the Yatra to different schools across Tamil Nadu. Rajesh Marathe and Vaishvik sponsored our t-shirts of Ramanujan Yatra. All the participants, their parents believed that this Yatra can be a very unique experience for all of them. Our sincere thanks to all of the above and many more in family and friends who were with us throughout this period. We couldn’t have done it without you. Last but not the least, we believe that it was Ramanujan who worked through us and the blessings of people like PKS who had a great dream, a great vision, that continues to be fulfilled even after he is gone. Indic Academy is proud to have been associated with the Ramanujan Yatra program by providing a grant for it’s promotion and registration fees for deserving participants. IndicToday had previously made an announcement regarding the Yatra. Vinay Nair earlier worked with various MNCs in India and abroad before shifting his focus completely to Mathematics education in 2009. He is experienced in K-12 education and conducts extensive training and education programs across the country. Primarily, he focuses on building reasoning skills, creativity and inquiry through Mathematical thinking. 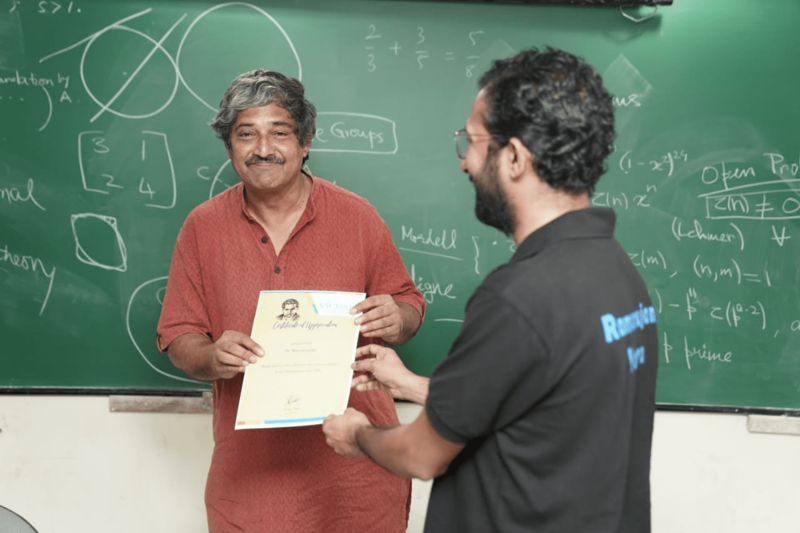 He is a co-founder of an NGO, Raising a Mathematician Foundation, founder of Vichar Vatika, School of Vedic Maths, part of School of ThinQ, and an affiliate of Chinmaya International Foundation.